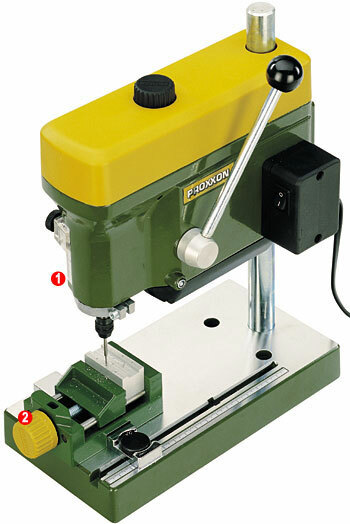 With a high-quality machined worktop, ribbed and die-cast from aluminium, this machine is suitable for precise work, using drills of diameters as small as 0.5mm. The base accommodates an adjustable fence with built-in scale, and holds a 340mm long, 20mm diameter solid steel column, off which the drill head mounts. Durable and quiet, the die-cast head has a VDE (Verband der Elektrotechnik, comparable to IEEE) approved 85-watt motor for intermittent duty, with a long life expectancy. The VDE 0530 standard is met at level "KB 10min" which specifies a 10-minute maximum ON cycle followed by a 10-minute minimum OFF cycle for cool-down. Power transmission is by aluminium pulleys and a flat belt. Three spindle speeds are available, and naturally, triple torque is available at the lowest speed setting. The action of the feed lever can be read against the fully adjustable depth gauge/scale. Machine vise, workpiece and tool not included. 1 3 spindle speeds by shifting the flat belt for more than the triple torque in the lower rotational speed range. 2 Fully adjustable depth gauge. 4 6 MICROMOT steel collets are included in the scope of delivery. Die-cast zinc. With three machined sides. The slot fits the adjustable fence of the drill stand MB 140/S and bench drill TBM 220. Horizontal and vertical V-slots in jaw. Jaw width 50mm and height 10mm. Maximum clamping width 34mm. Made of solid aluminium with surface treatment and fitted with adjustable dovetail gibs and three T-slots of the MICROMOT standard (12 x 6 x 5mm). Adjustable ruler eases workpiece positioning. Both handwheels have zero-resettable dials with graduations indicating 1 Made of solid aluminium with surface treatment and fitted with adjustable dovetail gibs and three T-slots of the MICROMOT standard (12 x 6 x 5mm). Adjustable ruler eases workpiece positioning. Both handwheels have zero-resettable dials with graduations indicating 1 revolution = 1.0mm and 1 division = 0.05mm. The clamps and securing bolts for the MB 140/S and TBM are included. 1 Two step clamps are included. 2 Table of 200 x 70mm with 3 T-slots. (1 revolution = 1.0mm, 1 division = 0.05mm). 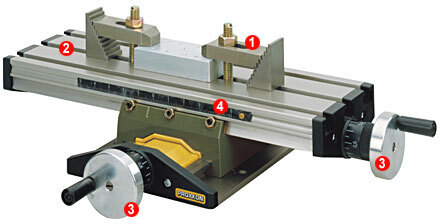 4 Moveable ruler eases workpiece positioning. 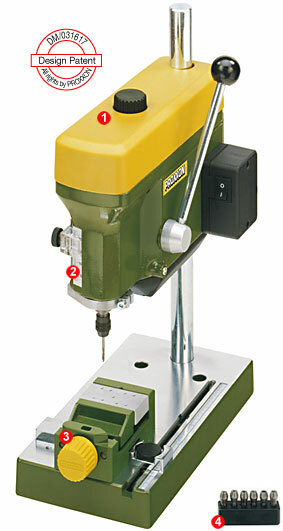 Click the button below to add the PROXXON Bench Drill Machine TBM220#28128 to your wish list.